Big names, small sizes, but which is better? It's here, it looks like the S5, but it's smaller. Naming success. Until now the Sony Xperia Z1 Compact has arguably reigned as king of the compacts and mayor of the minis, with its impressively high end specs and premium build. But Samsung's back and has its eye on the throne with a shrunk down version of its latest flagship, the Galaxy S5 Mini. So has Samsung taken a similar approach to Sony? And how do these two pint sized prospects compare? We've got all the answers. The Galaxy S5 Mini stays very close to the design of the Samsung Galaxy S5. In other words it has a mottled plastic back cover and faux-metallic edging, while at 131.1 x 64.8 x 9.1mm and 120g it's fairly small and light, somewhat living up to its name. The Sony Xperia Z1 Compact certainly looks the better of the two, thanks to real metal around the edge and a glass back. For better or worse it's more angular than the S5 Mini, but it certainly looks more premium. That metal and glass comes at a cost though, as it's a little heavier at 137g. It's also slightly thicker, measuring 127 x 64.9 x 9.5mm. It's worth noting that both the S5 Mini and the Xperia Z1 Compact are dust and water resistant, with IP67 and IP58 certifications respectively. 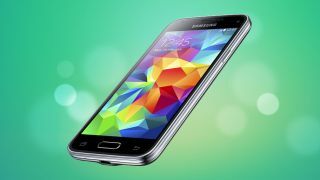 The Samsung Galaxy S5 Mini has a fairly large 4.5-inch Super AMOLED screen, pushing the definition of mini. The good news is that with that large size comes a decent 720 x 1280 resolution, for a pixel density of 326 pixels per inch. The Sony Xperia Z1 Compact has a slightly smaller 4.3-inch IPS LCD display, but it has the same 720 x 1280 resolution, so its pixel density is actually a marginally higher 342 pixels per inch. That's not likely to be a noticeable difference and both are among the best that you're likely to find on a smaller size smartphone. Both the Galaxy S5 Mini and the Xperia Z1 Compact have gone quad-core, so neither should feel short on power, but there are some substantial differences between them. The S5 Mini has an own-brand 1.4GHz quad-core processor paired with 1.5GB of RAM, while the Xperia Z1 Compact has a meaty 2.2GHz quad-core Snapdragon 800 processor and 2GB of RAM, so despite being older it should still be the more powerful of the two. Both handsets run Android 4.4 KitKat, however their UI's are quite different as the S5 Mini uses Samsung's TouchWiz, while the Z1 Compact uses Sony's Android UI. It's subjective as to which is better, but Sony's one is a lot closer to stock Android, while TouchWiz is more feature packed and includes Samsung staples like S Health. These two shrunken smartphones come with very different cameras. The Galaxy S5 Mini has an 8MP snapper inherited from the S4 Mini, coupled with a 2.1MP camera on the front. The Xperia Z1 Compact on the other hand has a 20.7MP main camera, so we'd be surprised if the S5 Mini can compete with it. The Z1 Compact even has a dedicated shutter button, so there's no need to tap on the screen. There's less difference on the front though as the Z1 Compact has a 2MP snapper above the screen. Both phones also have an LED flash and various shooting modes, such as Virtual Tour on the S5 Mini and Timeshift Burst on the Xperia Z1 Compact. The Galaxy S5 Mini has a 2100mAh juice pack. Samsung hasn't released any battery stats but it comes with the same Ultra Power Saving Mode as the Galaxy S5, so one way or another you're likely to be able to eke a lot of life out of it. The Xperia Z1 Compact has a slightly bigger 2300mAh battery which we've found can easily last a day of use and has its own battery saving features in the form of Stamina mode.